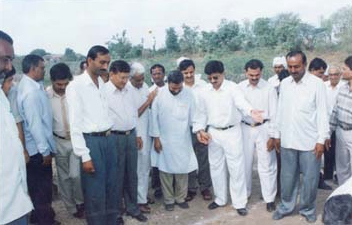 Mathurbhai and Village people at site. With very uncertain rein people of Saurashtra region suffers the horible condition due to draught and drinking water scares. From years our president (Mathurbhai) by passing throught the situation was throught how to overcome. In 1991 with few friends of the same worry and thought they have stone the foundation of Saurashtra Jaldhara of the same worry & thought they have stone the foundation of Saurashtra Jaldhara Trust (SJT). A NGO surat for creating averness in the people how to retain all the drops of rain water on land with in the same land. Initialy he (President) visited accompaing their friends few of the area tried conserved the rain water. He himself create a typical Model Project in his own village KHOPALA which was by situation adverse to collecting the rain water. By getting the success & getting the more crop product in the same year the trust started “ABHIYAN” of people awareness by Padyatra and Gramsabha. The President & trustees those residing at Surat visited Saurashtra almost 255 times, 1035 days to addressing 2200 gram sabha & Village commitee meetings. They have tried in an ammormous way by a “Mahasabha” of approximately 3 lacs people at Surat in 1999 in presence of C.M which actually given them a trimendeous responce creating a donations of purchasing JCB machines & leading people of village from Saurashtra forming atleast 3000 gram committee.By developing awarness the people participate in check dam yojana and contributed almost 175 crores of rupees trusting SJT’s involvement in it. Government declared 60:40 Sardar Patel Sahbhagi Jalsanchay Yojana. The effort made by SJT and gram committee within the first fase of yojana what ever checkdam were constructed, overflows during the very first monsoon. Farmers, benifited immensily from increased crop production. The most sensitive part of land acquisition was not came in picture as it does not required. The president SJT and ihs team decided how to help gram committee provideing free of cost JCB’s and contribution in cement cost. Thus people’s participation cost reduces. Thus more and more villages come out with proposal of construting nos. of checkdam in their visinity. Mathurbhai and Rajeshbhai discussing stratergy. On getting their full co-operation and confidence he put the scheme against the rich people having love and affection towards motherland. They promised to give full support and co-operation for such noble and unselfish work of check-dam yojana. On getting such support and co-operation from enthusiastic youths as well as people having affection towards motherland, now there was no major hindrance to go ahead. He made a committee of enthusiastic persons and described the check-dam yojana and its benefits to the villagers with the help of committee and other friends settled in Surat. He also described the benefits of collective and united work. The villagers have given their hands for full support. On getting united the villagers, the work of check-dams was started and completed 200 check-dams and 10 reservoirs within a period of six (6) months. On very first rainfall all the check-dams and ponds are overflowed and the people of village get not only relief from water crisis but they get water for irrigation also. The water table came up by 20 to 50 feets in wells and bores. The prices of agricultural land of Khopala village gone up to double. The people of village get highly pleased on the creative work of Mathurbhai but Mr. Mathurbhai was not satisfied with the yojana in his village only. He wanted to get the problem of water crisis solved in entire Gujarat. He thought that to solve the problem in entire Gujarat only the “Will Power” of villagers is necessary. If the people of villagers take the responsibilities of there own villages and by “Will Power” start the work of check-dam yojana in their villages, nothing is hard to solve the water crisis in Gujarat. Then the question is how to awaken the “Will Power” in the people of villages of entire Gujarat. Saurashtra Jaldhara Trust promoted by Mr. Mathurbhai Savani and other Trustees is doing this work of awakening the “Will Power” of people of Saurashtra, Kutch and North Gujarat to solve the water crisis by our own hands.